You might be thinking: Why should you bother getting a camera when you've got your trusty old phone? Not only will a trusty camera help you evolve with your photography skills, but it also develops your vision. You'll get to test out a lot of angles and composition, trying your best to find the lighting you need for that perfect shot. You learn patience and timing, which are essential not only in taking photos, but in life overall! You might think that bringing your DSLR or camera will be very clunky, but so long as you pack it right, you'll still enjoy the trip without worry of safety or weight. They can be brought around anywhere you go! The one thing cameras have that phones don't is the crisp and vivid images. Sure, cameras on phones are evolving, but it doesn't beat the beauty you capture using a good camera. It's clearer, you're more satisfied, and they'll go perfect on picture frames. You'll get to highlight your trip and show everyone what you saw and what you did in clear photos or videos! You're convinced you want a camera, but the question is: How can you get the best one suitable for you? It's not the easiest process, especially when you're a beginner. But so long as you do the proper research and testing, then you'll be able to get the best out of it. You're backpacking, meaning everything you bring will literally be on your back. You'll need to focus on a lightweight camera, which includes the lens (if you're bringing a DSLR). The lighter, the better. Just remember not to scrimp on quality! You'll want to make sure you have the appropriate and clear zoom lenses to catch the action close up, may it be concerts or animals you can't go near. This is probably a given, but just remember that the most expensive cameras won't usually give the best results. When we mean highest quality, we talk about megapixels and how it performs during the sunrise and sunset (Lighting is essential!). For backpackers, we recommend a single zoom lens to avoid having to bring heavy tripods and a lot of lenses that take up room and weight. Wide angle zoom lens are a must to get the whole scenery! Using a DSLR or point-and-shoot camera has manual and program features that should be quick and easy to use so you won't be blubbering and miss your once-in-a-lifetime shot! The viewfinder shouldn't only be bright and clear to check your photos, but it should also have all the information you need in just one screen. That way, you know what to expect when taking a photo. The more positive the reviews, the better! We recommend that you start off with popular brand names so you are assured of quality until such time you get to know the ropes and experiment with other models and brands. Nikon and Canon are one of the most popular names in the photography world, ensuring quality and great photos when traveling from Asia to Europe! Now that you have a camera in mind, what should you do to assure safety and great photos? Always remember to wear your camera strap. This will prevent it from falling and breaking while taking a shot, especially when your camera's up in the air while you do it! Invest in weather-sealed gear, such as waterproof bags or lens filters to protect your camera. This may seem like extra expenses, but it will improve your camera's lifespan. A padded bag is a must to separate your gear and keep them from bumping each other. While we aren't using film cameras and shots aren't limited, you will want to focus on the lighting and composition to take the perfect shot (so you won't have to keep doing it again!). Go behind the light when taking photos of your subjects to avoid shadowing, and remember the rule of thirds before taking that perfect shot. You'll be everywhere and facing different weathers. So will your camera! Protect it from the heat and avoid exposure under the sun, as this will slowly damage your camera. Also, if you are in cold weather, keep it cold and don't hide it under your jacket to warm it up. It may end up condensing and being hard to clean. Nikon is one of the leading brands in the camera industry, and one of their newest releases, the Nikon D5300, is a stunner. It has the same and classic design of Nikon DSLRs, but with an upgrade, including the swiveling LCD screen and crisper image/video quality. What I love about the Nikon D5300 is the swiveling LCD screen, so I'll be able to easily check the display out when taking photos with angles I won't be able to see through the viewfinder. It also makes me take great selfless and videos of me, since I will be able to see myself, thanks to the swiveling LCD screen! Another cool perk is that it comes with built-in Wi-Fi and GPS, so I can easily connect it to my phone or laptop to sync the photos for posting quickly! At a price less than 500 (with the standard lens already! ), it is a great deal and I would recommend this for people who want a camera with all the advanced features. The Canon PowerShot is a small and handy digital camera, perfect for travelers who can't fit in any more photography equipment in their backpacks! We love its small and compact build, but don't be fooled by its size. It's 12.1 megapixels, which is crisp and more vivid than most phone cameras. It also has a wide angle lens to capture the whole scenery. I love its image stubblier, which helps keep the image stable and clear despite my shaking hands. Also, it's very easy to connect to your laptop or monitor with its HDMI output. All in all, it's the ideal camera for those who want something small and lightweight, but with the features that create wonderful photos and videos. I would recommend this for casual photographers who want something clear for their travels. For those who want a quality DSLR, Canon is another excellent choice. What we love about would be its crispness, but Canon holds more dreamy yet vivid and colorful image quality. The camera itself is 18 megapixels, with a touch-LCD screen, which I find better than having to use arrows or the dial when adjusting the settings. When I first carried the SL1, I was very surprised as to how light and small it was. Compared to Canon's last models, it felt easier to grip and hold. And it didn't take up too much space or weight in my backpack! As for its image quality, Canon will always deliver. It's very easy to use and adjust its settings, making it a favorite for many. It's an excellent choice for those easing into the world of photography and want a DSLR that won't take up too much weight or space. Sony is another famous brand name to trust when it comes to both phones and cameras. The DSC-RX100/B is a compact camera with all the advanced features you want and need. It's 20.2 megapixels with an excellent zoom lens and vast ISO settings, ranging from 80 to 25,600! When they claim it to be the professional's compact camera, they really do mean it. It's ideal for professionals and amateurs alike because it's easy to use, comfortable to carry, and will still product the best and clearest photos. You have a lot of settings to choose from, as well as the satisfaction of DSLR-like photos with just a point-and-shoot camera. I would recommend this camera for those who want something light, but with similar results of a DSLR! Another brand name to trust, the Olympus TG-4 offers what most DSLRs cannot, and what only some digital cameras can: a waterproof body without the need of casing. Waterproof is what I'm after when it comes to cameras, especially as a backpacker who loves the waters. Now, I'll be able to take photos when swimming, and I won't need to worry about it getting wet and broken. It also has a wide-angle optical zoom and a clear 16 MP image quality. It's one of the more affordable cameras in this list, with a price ranging from $350 to $380. With its clear photos, waterproof abilities, and compact body, it's definitely a great deal I would recommend anyone to get! When it comes to photography and capturing moments while backpacking around the world, the best camera will be able to help you out with that. Not only will you have photos to show to your family and friends, but a memoir and better skills as you travel and appreciate the sights around you. Of all the cameras we've researched and tested, the best one will have to go to the Nikon D5300. With its swiveling LCD and crisp photos and videos, it's one of the most affordable for the camera's name and quality. Everything about it screams elegance and beauty, and who wouldn't want to bring a DSLR for the vivid images and videos as they travel the world? It's light, easy to bring around, and you'll have a camera to last for years of journeys. 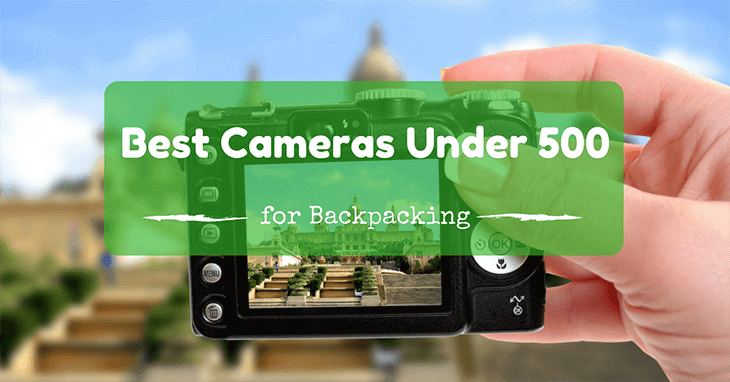 We hope that this article on the best cameras under 500 for backpacking helped you become more knowledgeable on what you need for your next vacation. You can purchase the Nikon D5300 or any of these cameras from reputable online shops, or from gadget stores near you. So what are you waiting for? Instead of using your phone, invest in the best camera and hone your skills while capturing memories along the way. If you found the article informative or want to post your own reviews about the best cameras under 500 for backpacking, then comment down below. We'd love to hear what you have to think.